We are so close to the end with our Anise jacket. This is the final week of sewing! Today we’re putting in the sleeves. 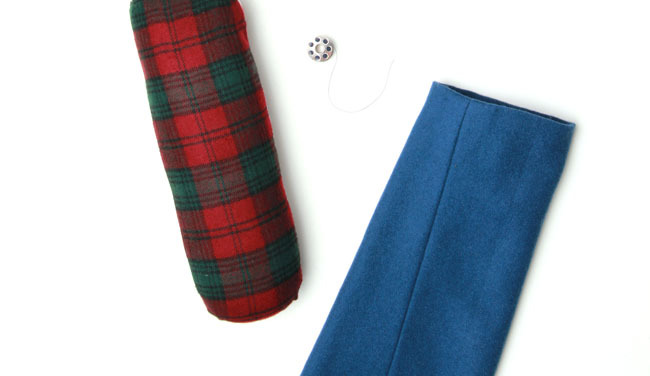 Your goals when setting jacket sleeves is to get a sleeve that hangs well and has a lovely soft roundness at the cap. To do this, you’ll use ease, heat and moisture (i.e. pressing), and internal support (shoulder pads and sleeve heads). After the sleeves are done, we’ll get the jacket hemmed. Be aware that today involves a fair bit of hand sewing, so put aside some time for that! Sew the jacket’s side seams. With right sides together, stitch jacket front (A) to jacket side back (C) at side seams, matching notches. Press the seams open. With right sides together, stitch the upper sleeve (M) to the lower sleeve (N) at the front seam, matching notches. Press seam open. Stitch the upper sleeve (M) to the lower sleeve (N) at the back seam, again matching notches. 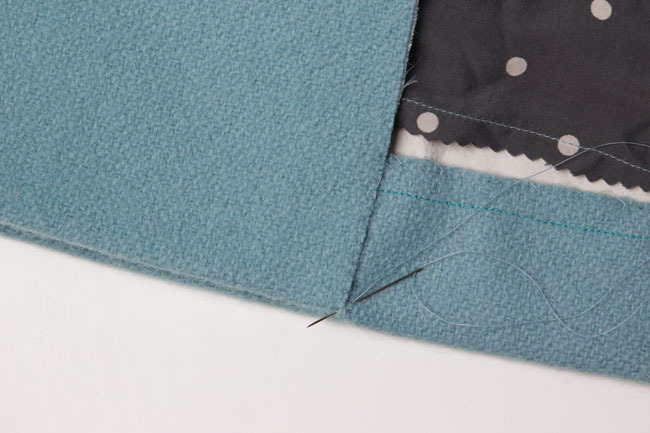 Use several pins to help sew the curved edge of the lower sleeve (N) to the upper sleeve (M) at the cuff, clipping the seam allowance if necessary. Press seam open. Ease the cap of the sleeve between the small circles. To do this, stitch using a long stitch length 5/8” from the edge. Stitch a second row 3/8” from the edge and a third 7/8” from the edge. Leave long thread tails which can be pulled to adjust ease. With right sides together, pin sleeve into armhole, matching notches and seams. 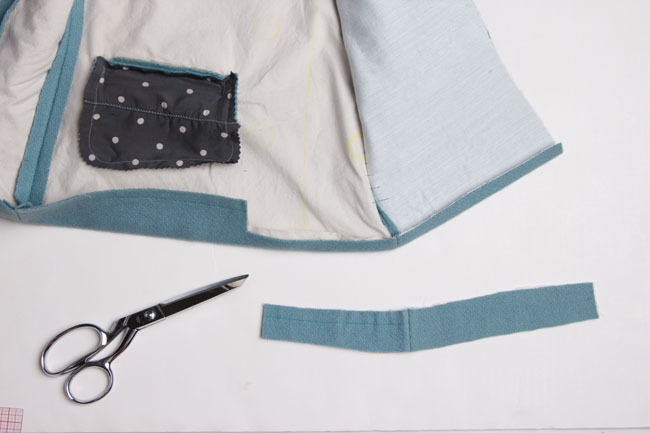 Align the large circles on the sleeve with the shoulder seam and side seam. 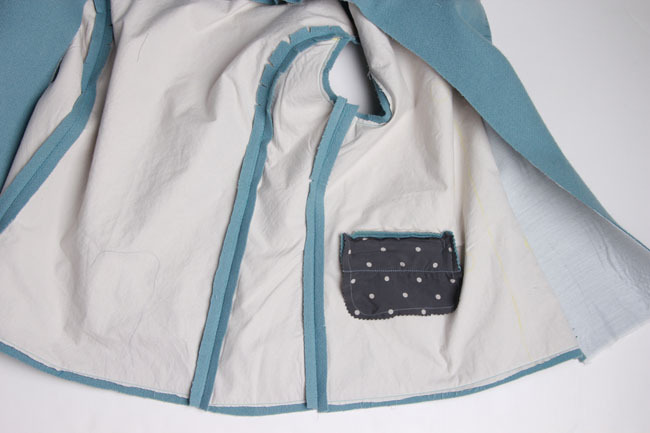 Align the back seam of the sleeve with the seam on the back of the jacket. Pull ease stitches to adjust, distributing fullness evenly. Pin from the inside. 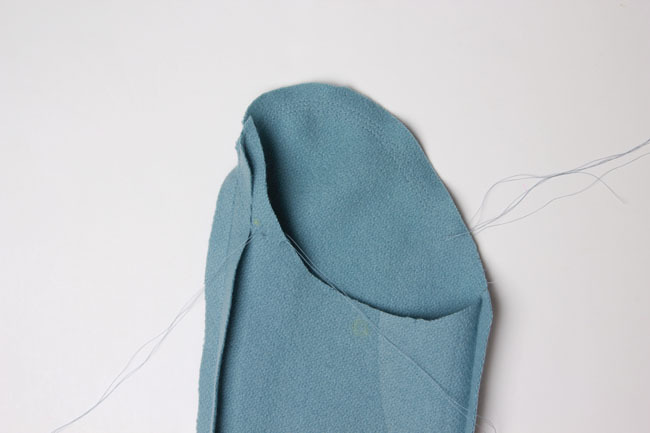 Machine baste sleeve into armhole using a long stitch length, or baste by hand. Stitch sleeve into place, stitching from the inside. 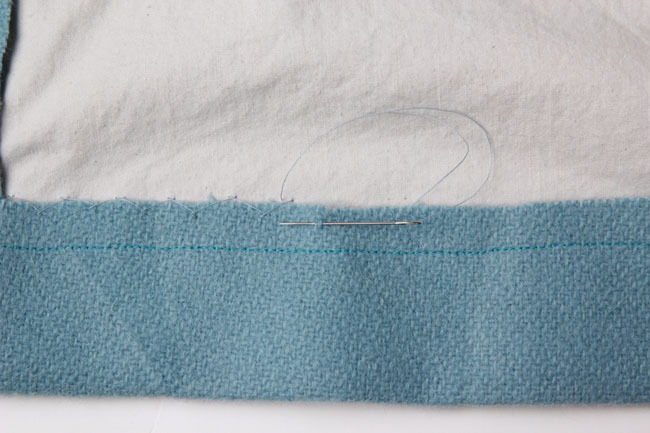 Stitching from the inside may feel a little awkward, but this way you can watch for any puckers or folds that might form in your sleeve while stitching. 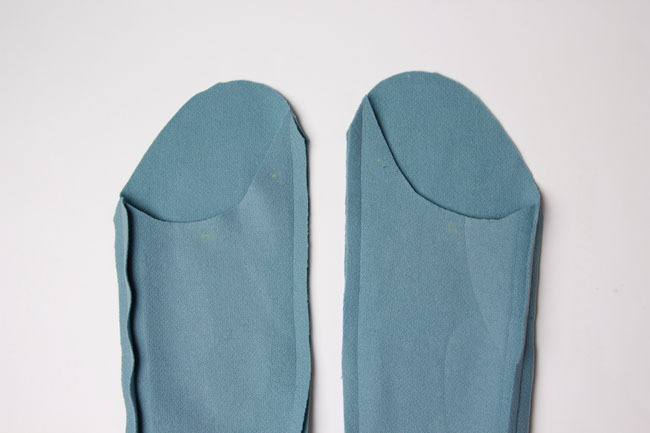 Press sleeve seams, pressing seam allowance toward the sleeve. 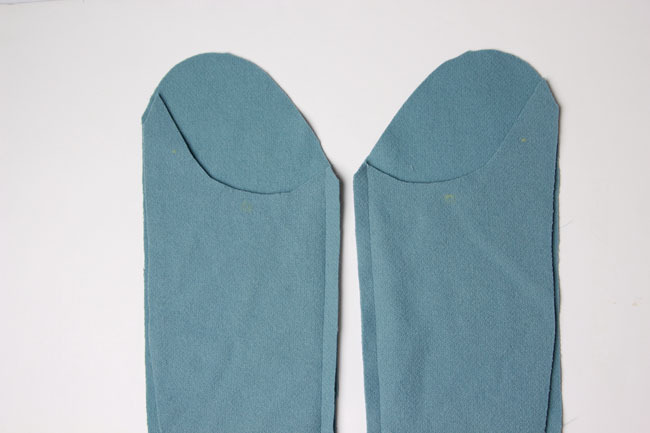 Sleeveheads are an optional addition, which you can insert before shoulder pads. 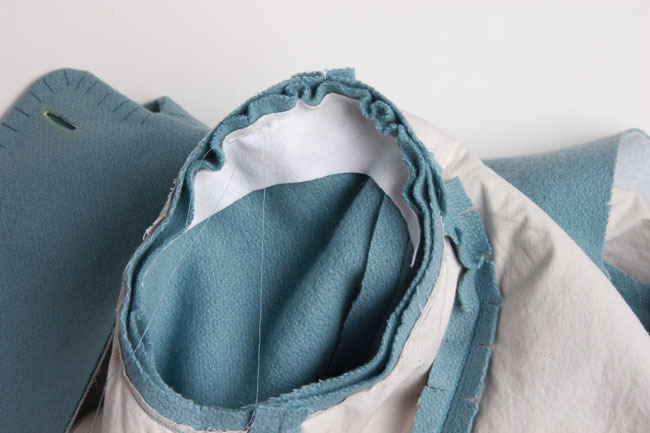 They will help to structure the armhole of your jacket, which you may or may not need depending on your shoulder pad, fabric choice, and your own personal preference. I prefer them, especially for heavier fabrics. They prevent the cap of your sleeve from collapsing or dimpling in an unsightly way. You can purchase sleeveheads, or you can make your own. In The Anise Companion, I show you how to construct your own based on the pattern and some flannel. This is totally optional, but if you want to take a crack at making them, follow the instructions in the companion (pp. 55-57). Baste the sleevehead into the armhole. Try on the jacket along with the shoulder pad pinned in place. You may decide you don’t need the sleeve head, of you may decide to make it narrower or alter it in some other way. Once you have it the way you want it, stitch it permanently to the shoulder seam allowance. 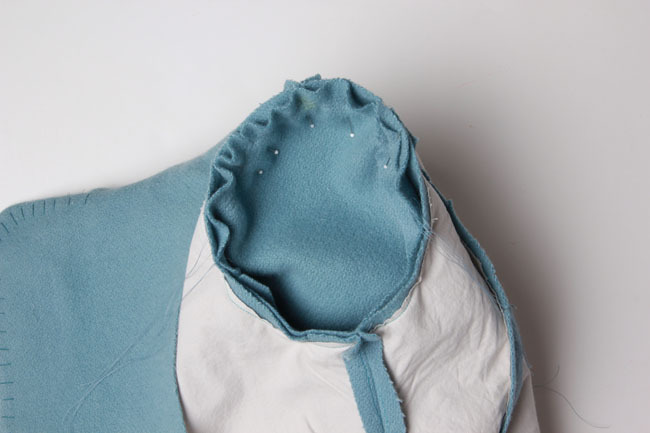 Place shoulder pads onto shoulder, allowing pad to extend 1/2” into the armhole seam allowance. 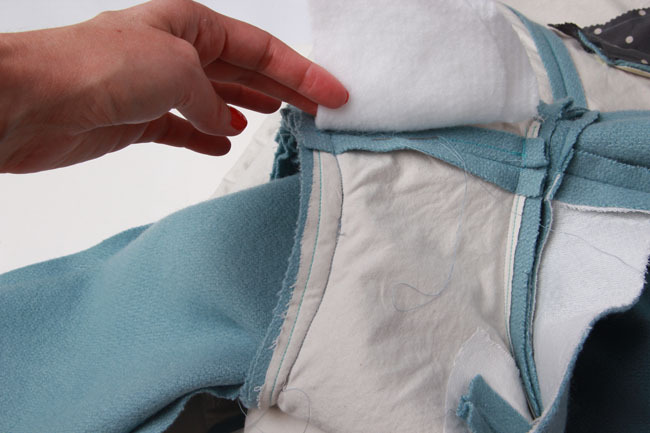 Hand stitch the pad to the shoulder seam with a catchstitch. Tack the lower edges to the armhole to keep the pad in place. Open the facing front (E) away from the jacket. Remove a few inches of the basting at the bottom, which will allow you to do this more easily. Turn the entire lower hem up 2” and press. On the facing front (E) and jacket front (A), trim the hem to 1/2” up to the large circle. This trimmed portion of the hem should be covered up by the facing once you fold it back to the inside, so check to make sure you have it marked correctly before trimming. 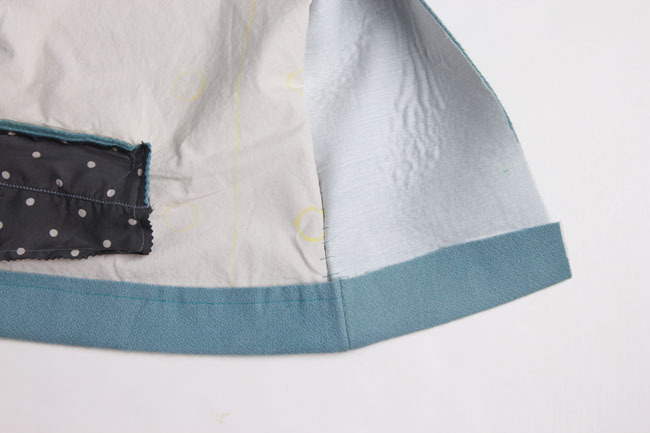 Hand stitch the hem to the garment, using a catchstitch. Turn the facing front (E) back to the inside of the garment. 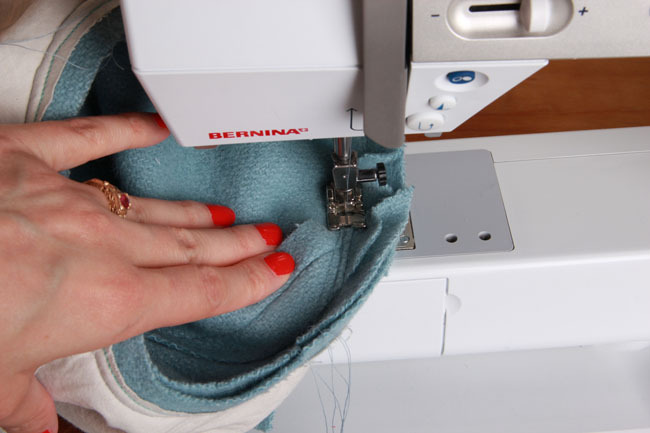 Hand stitch the hem of the facing to the hem of the jacket using a fell stitch. Hemming was actually pretty easy, wasn’t it? Ok, so it takes a while to hand stitch, but it’s not hard to figure out, at least. On Thursday, we’ll cover the final stage, so get ready for lining your jacket! And once again, be sure to stop by the Flickr group for the sew-along! I can’t tell from the pic (will look it up in the companion) but is that a raw edge you fell stitched to the hem? Also I can’t find it in the companion but is there a page some where were all the checklists for the 8 days are in one place? Yes, it’s unfinished. With most wools like this, it should be fine fell stitched this way. 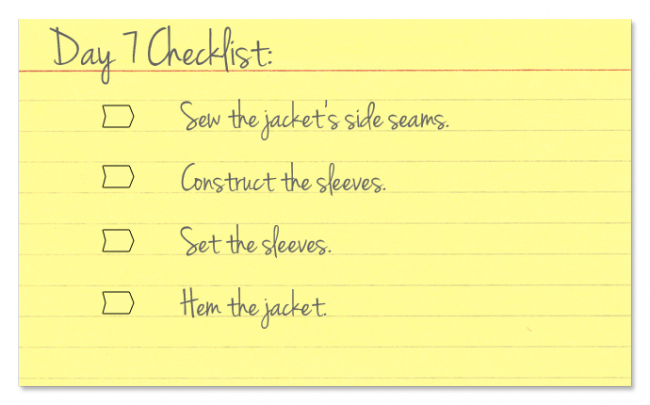 There’s no page with all of the checklists, but I agree that that’s a good idea. I’ll keep it in mind for future ebooks in the companion series! Sarai, thank you for hosting the sewalong. I own the Anise Companion but have been stuck on the sleeves for a while, I hope you or one of your readers can help! I can’t figure out if I’m setting in the correct sleeve into the correct armhole – in the third photo you provided above in “Construct the sleeves” – which (left or right) sleeve is that (and which armhole do I pin that to? Also when I pin the sleeve it swings forward, is that correct? Thanks! First, are you matching up the notches? That should help make sure that you are setting the sleeve in the correct way. The double notches will be towards the back of the jacket, the single notches to the front. Make sure your circles are aligned with the shoulder seam and underarm seam as well. You’ll also notice that the seam that is higher on the sleeve will be toward the back, the lower one toward the front. Make sure your easing is adjusted evenly as well. Sleeves should hang a little forward to mimic the hang of your arm, but not swing dramatically forward.